 Yea, Bezos' grandfather was a real "nobody". Just an everyday manager at the AEC. "Lawrence P. Gise, manager of the Atomic Energy Commission's Albuquerque Operations since Aug. 1, 1964, retired this week after almost 33yrs of federal government service." "James L. McCraw, ALO deputy mgr, is acting manager of Albuquerque Operations until arrival of Lt. Gen. Harold C. Dormelly, USAF, about Aug. 1. Now director of the Defense Atomic Support Agency, Washington, D.C., General Donnelly is retiring from military service after 35yrs"
 "Mr. Gise joined Dept of Agriculture in Washington as a messenger in Aug 1935. He left that agency as chief, Administrative Service Division, Bureau of Chemistry and Engineering in 1942 to transfer to the Public Building Administration." "That same year (1942) , [ #Gise ] entered the U. S. Navy and served as an officer for four year." "Following his military service, [ #Gise ] served briefly with the Veterans Administration in Dallas and later with the Navy Department in Washington." " #Gise joined the AEC's Division of Finance in 1949, transferring the following year to the Division of Military Application. He became assistant director of the division in 1955." " In 1958, #Gise transferred to the Advanced Research Projects Agency of the Department of Defense where he served progresively as director, Program Control and Administration; assistant director for administration, and deputy director." " Mr. #Gise was president of the Albuquerque-Santa Fe Federal Executives Association, an officer and director of the United Community Fund, and a member of the Albuquerque Armed Forces Advisory Committee." "Two members of the Atomic Energy Commission and key members of the AEC Headquarters and Albuquerque Operations staff visited the Laboratory last week for technical briefings on Sandia weapon systems and other programs." AWARD from U.S. Navy presented to LP #Gise , manager of AEC Abq Operations for organization's contribution to Navy's Fleet Ballistic Missile System. Cmdr Dan Piraino, representing Navy's Special Proiects Office, D.C., presented award. "VISITING SANDIA LABS recently H. T. Herrick, Director, Labor Relations, AEC, Wash DC; and John P. Chapman, Asst Dir Labor Relations, who reviewed administrative policies and programs with President John A. Hornbeck and LP #Gise"
"VISITING SANDIA  was US Rep John F. Rhodes from Arizona (center). A member of the House Appropriations Committee, Rhodes met with LP Gise (left), mgr of AEC/ALO, and CW Campbell, VP 4000, before visiting some of the installs." "VISITING SANDIA LABS last week were Robert E Hollingsworth (left), GM of the AEC, and Wilfrid E Johnson (2nd from left), AEC Commissioner. They talked w/ John A. Hornbeck, Sandia Corporation President, and LP #Gise (right)"
LP #Gise promotion at Sandia pictured in same Sandia Lab News ( VOL. 16, NO. 14/ JULY 3, 1964 ) as remembers the JFK Assassination . "Born in Laredo TX, April 23, 1915, he is a graduate of Columbus University (Bachelor's degree, Commercial Science) and in 1940 of Strayer College (Master's degree, Commercial Science), both in Washington DC." "He was a Lt. Command•r in the Navy from 1942 to 1946, served briefly with the Veterans Administration, then returned to the Navy Department as Deputy Chief of the Estimates and Analysis Division, Budget Office." "In 1958, he went to the Advanced Research Projects Agency of the Department of Defense, where he served until 1961, progressively in the position of Director of Program Control and Administration, Assistant Director and then Deputy Director." @GeorgWebb was talking just today about nuclear-powered rockets ! So now #DARPA / #ARPA ... Who did come up with the name ? In a 1975 conversation , LP #Gise mentioned that he believes Lt. Col. George Brown, USAF, a military assistant in, Holaday's office, actually came up with the name "ARPA". Ultimately through, LP #Gise was recruited in 1958 "from the AEC to handle the Agency's [ARPA's] financial management activity"
 1958 - "An office of Program Control + Administration (led Gise) consisting of 7 civilian professionals, was set up to handle budgetary control and, assignment of funds to Service agents for contracting (through what became formalized as the "ARPA Order" system), ...."
 The IDA (Institute of Defense Analysis) was the first to help plan the first group of ARPA projects. Upon creating a TOD (Techncial Operations Division), #Gise was elevated to the position of Assistant Director for Administration. LP #Gise was incredibly influential in the procurement model of early #ARPA . "The Saturn IB (pronounced "one B", also known as the uprated Saturn I) was an American launch vehicle commissioned by the National Aeronautics and Space Administration (NASA) for the Apollo program. " Who could have guessed that LP #Gise was there for the Saturn IB budget meetings in the fall of 1958 for #ARPA ... I have a lot to read on the subject, mostly grabbing highlights now. What? The grandfather of Jeff Bezos was director at DARPA and Sandia, and was thanked by the US Navy for nuclear warhead SSBM (surface to surface ballistic missiles) tech for US submarines? I thought Amazon only got big because Bezos is “son of an immigrant”! Holy firetruck - Was LP #Gise (grandfather of #JeffBezos ) the man at the Atomic Energy Commission ( #AEC ) that signed over control of the #RockyFlatsPlant in the 1960s to #DOW Chemical ???? This looks like a fun read you can get on Google books - "
Elements of Controversy: The Atomic Energy Commission and Radiation Safety"
 And there that pesky ol' LP #Gise is again, discussing nuclear weapons testing in 1956, as a regional maanger at the Atomic Energy Commission. Just a great big nobody - Just a footnote in the "How #Amazon was created" book. Now, Guess who had a dad who was a lifetime exec at DuPont? Of course ..... #RobertMueller 's own father, Robert Swan Mueller Jr. So LP Gise was a US Navy officer (admiral actually), as was Robert Swan Mueller Jr., Born one year apart. Hmmm... Robert "Highly Enriched Uranium" Mueller's dad is widely rumored to be a Nazi Paperclip (Heinrich Muller). Now the wheels are turning. Today I bought underwear for a man I didn't know. I was out running errands and decided to stop at Whole Foods to grab something quick for lunch. This WF happens to be next to a TJ Maxx, and this man was hanging around outside. I smiled at him, because I try to be friendly, and he asked if I could "help." I didn't have any cash (and don't usually feel comfortable giving people cash on the street) so I said I couldn't. Hi #entrepreneur #startup: One of the best businesses to start - building up the best #distribution pipeline and providing awesome #CustomerExperience . Amazon to buy (for $1bn) online pharmacy @PillPack which ships prescriptions around the US, and overnight. Under threat: $400 billion pharmacy business. 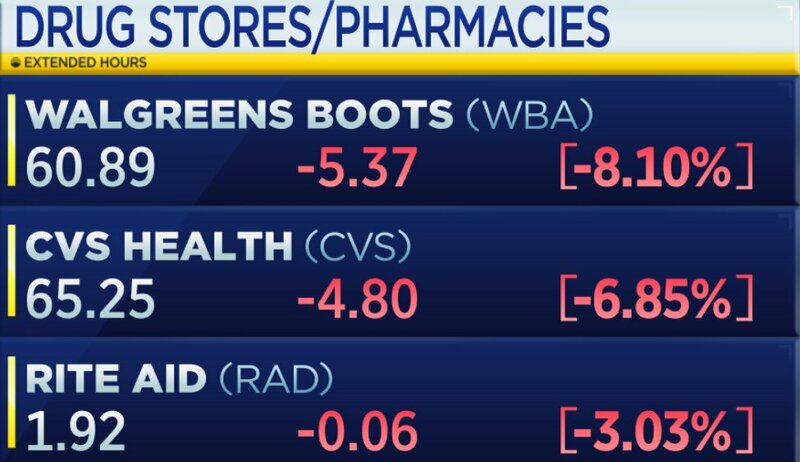 @Walmart @Walgreens @cvspharmacy stocks dropped. When people are confused about how people in Alabama are voting for a Child Molester and Racist scum, don't forget, Hitler was a Christian, Himmler was a Christian, Goebbels was a Christian. Nazi party all of the different Christian Religious Faiths in Germany supported the Nazis. They believed the New Government could protect them from Communism, sound familiar to you? They believed that the New Nazi Government would maintain traditional morals and family values. Today actually makes it over two decades since the sad killing of Ken Saro-Wiwa by the Nigerian State under Abacha alongside 8 others: Felix Nuate, Baronem Kobel, Saturday Dobee, Daniel Gbooko, Nordu Eawu, Baribor Bera, Paul Levura and John Kpuinee. I think it’s worth a Thread. This thread captures history from various perspectives all blended together to reveal a fuller picture. It shows that Saro-Wiwa was also human like any of us but he was exceptionally courageous and dogged in spite of his human flaws. Saro-Wiwa was a diminutive man who invariably always smoked a pipe and was considered quite brilliant. He wrote a popular play which was adapted for TV when we were younger “Basi and Company”. He was from Ogoni - an oil-producing area in Rivers State which has several villages.